Ski resort Novako is ideal for families with children and beginners. There is a children's playground, ski and snowboard equipment rental, buffet, ski school and children’s ski school (for children from 2 years) and snow tubing trail. Ski resort Novako is located in the centre of Boží Dar. You can go skiing even when the night falls during the night skiing hours. There are new toilets, a room to rest with a fireplace, skiing accessories store – hats, gloves, helmets, goggles. 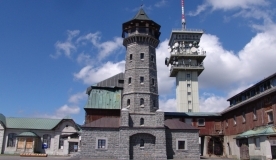 Ski resort Novako is located in the centre of Boží Dar near the tourist office „Infocentrum“.